图2. Binding activity of the Human CD19, Fc Tag before and after FITC labeling were evaluated in the above ELISA analysis. The result showed that FITC-Labeled and Unconjugated Human CD19, Fc Tag have almost the same binding activity. 图3. 293 cells were transfected with anti-CD19-scFv and RFP tag. 2e5 of the cells were stained with B. FITC-Labeled Human CD19 (20-291) (Cat. No. CD9-HF2H2, 10 µg/ml) and C. FITC-labeled protein control. A. Non-transfected 293 cells and C. FITC-labeled protein control were used as negative control. RFP was used to evaluate CAR (anti-CD19-scFv) expression and FITC was used to evaluate the binding activity of FITC-Labeled Human CD19 (20-291) (Cat. No. CD9-HF2H2). 图4. Binding activity of the Human CD19, His Tag before and after FITC labeling were evaluated in the above ELISA analysis. The result showed that the FITC-Labeled and Unconjugated Human CD19, His Tag have almost the same binding activity. 图5. Binding activity of FITC-Labeled Human CD19, His Tag from two different vendors were evaluated in the above ELISA analysis against FMC63 MAb. The result showed that ACRO's FITC-Labeled Human CD19, His Tag has a much higher binding activity than Other Vendor's. 图6. Binding activity of FITC-Labeled Human CD19, His Tag from two different vendors were evaluated in the above flow cytometry analysis against anti-CD19-CAR-293 cells. The result showed that ACRO's FITC-Labeled Human CD19, His Tag has a much higher binding activity than Other Vendor's. 图7. Binding activity of Human CD19, Fc Tag from two different vendors were evaluated in the above ELISA analysis against FMC63 MAb. The result showed that ACRO's Human CD19, Fc Tag has a higher binding activity than Other Vendor's. 图8. Binding activity of Human CD19, Fc Tag from two different vendors were evaluated in the above flow cytometry analysis against anti-CD19-CAR-293 cells. The result showed that ACRO's Human CD19, Fc Tag has a higher binding activity than Other Vendor's. 图9. Binding activity of Human CD19, Fc Tag from two different vendors were evaluated by SPR assay against FMC63 MAb. 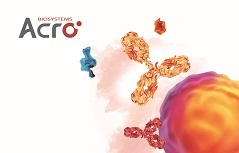 The result showed that ACRO's Human CD19, Fc Tag can bind FMC63 MAb with an affinity constant of 0.17 nM which is 2-fold higher than Other Vendor's Human CD19, Fc Tag. 图10. The purity of Human CD19, Fc Tag from two different vendors were determined in HPLC analysis. The result showed that the purity of ACRO’s Human CD19, Fc Tag is greater than 87%, while the purity of Other Vendor’s Human CD19, Fc Tag is greater than 57%. 图11. Binding activity of Human CD19, His Tag from two different vendors were evaluated in the above ELISA analysis against FMC63 MAb. The result showed that ACRO's Human CD19, His Tag has a much higher binding activity than Other Vendor's. 图12. Binding activity of Human CD19, His Tag from two different vendors were evaluated in the above flow cytometry analysis against anti-CD19-CAR-293 cells. The result showed that ACRO's Human CD19, His Tag has a much higher binding activity than Other Vendor's. 图13. Binding activity of Human CD19, His Tag from two different vendors were evaluated by SPR assay against FMC63 MAb. The result showed that ACRO's Human CD19, His Tag can bind FMC63 MAb with an affinity constant of 2.95 nM which is much higher than Other Vendor's Human CD19, His Tag.